All I had left to address was the 2nd gear synchro, and I wasn’t even sure I wanted to fix that last trace of Alfa idiosyncrasy. Nearly two years into the most involving, frustrating and absorbing auto ownership experience in my 25 years, I lost my Alfa, my garage, and with them, my GTI and two of my brother’s cars. I will be perfectly clear. Alfas are reliable; neglected cars are not. I had purchased a neglected 1989 Alfa Romeo Milano Verde two summers prior to bridge the gap between the BMW e30 I owned at the time, and the Ferrari 308 that I knew I shouldn’t buy. The practical exotic. 4 doors and a Busso V6 with an exhaust note that could embarrass any fuel-injected 80s Ferrari V8. A useable trunk and a rear-mounted transaxle with inboard mounted brake rotors. Room for human beings and a torsion bar front, DeDion rear suspension. And, under 3k RPM, you’d be hard pressed to turn any heads in traffic. But, neglected cars demand attention. And, buying sight-unseen, it can be difficult to uncover neglect. I don’t buy sight unseen anymore, and I have a better eye for neglect now. On the 500 mile drive home the night I bought the car, the cruise control called its own shots. Even fully shut off, I was surprised with a nice WOT acceleration courtesy of the malfunctioning cruise control unit. The car had a sizeable stutter at cruising speed as well, but I made it home, where the clutch hose burst. Fully mended, the car was less merciful on our next attempt at 500 miles two weeks later. 300 miles in, it threw a rod. It’s hard to hear a knock on the highway, and I didn’t hear it in time. So worried about the failure, I spent that labor day weekend in a dizzy state; my first case of vertigo. I spent the next 10 months rebuilding a replacement engine in my spare bedroom. Having smart friends is nice, especially when they help you through your issues. The car was ready in time for a visit to my brother near the tail of the dragon. We whipped the car to NC, back to TN, back to NC, and then it shed 6 axle bolts and a brake rotor. Cue my second case of vertigo. The rotor was gone, but my brother helped get 2 axle bolts into the trans hub for me to limp the 500 miles back to Detroit. At 2AM in Toledo, the bolts finally yielded. Somewhere during the mess of loading and unloading the car onto the flatbed, the timing belt skipped and bent 3 valves. The engine didn’t take nearly as long to pull the second time. In hindsight, a compression test would have shed light on the bent valves, but with only a knock to go by, and some bearing material in the oil pan, I went in whole hog. In the ensuing 8 months, I rebuilt the bottom end, repaired the head, rebuilt the brake calipers, rebuilt the axles, and repaired more threads than I ever care to again. Engine installed, we got it started one night. I went back out later just to listen to it, but it wouldn’t turn over. The timing belt had skipped; a bad tensioner spring was to blame. The next round of repairs took a month, during which I replaced and lapped in new valves. To prevent any more agony from skipped timing belts, I even modified the timing belt tensioner to Alfa Rob spec. This time the repairs took, and I took my girlfriend out for gelato at 10PM. I drove my Milano to the local Alfa hive, where I lent the wheel to a trusted Alfa mechanic and driver friend. With the car loaded up for a hard left, the passenger torsion bar snapped right beneath my seat. He made the save, and we limped the car to his place. I was sent home with parts, tools, instruction, and a hurting Milano. Torsion bars aren’t even positively retained to a single component in the car, but it took a solid week of hammering, heating, penetrating oil spraying, whining, pickle forking, and air chiseling to get the broken passenger side torsion bar out. The driver side bar was a write-off. Control arms would need to be replaced, as would the bushings and ball joints. I ordered the best suspension bushing, ball joints, and tie rod ends available, and, with the help of Alfa Rob, installed them on a freshly painted set of control arms and caster rods. I grinded away any sign of rust on the chassis, primed, painted, and installed the new bits. The resulting car left me so satisfied that I can’t imagine something more enjoyable at any price. I entered I-94, opened the sunroof, and proceeded to wring out third gear through every overpass. Even better, I nailed it through the tunnel under Cobo Hall – a dream that had eluded me up to this point. When I sat down for pizza, I picked a spot where I could see my Alfa on the street. On the drive home, I hit a big Detroit pothole, and immediately lost ignition, so I got a free AAA tow back to my house. I pushed my Milano into the garage, called a friend, and set out to troubleshoot the ignition issue as prescribed in the service manual. During an attempt to start, the engine backfired through the intake, blowing the intake off of the runners, and setting the fuel hoses on fire. By the time I had caught my dog, who had been sleeping in the garage, the entire engine bay was ablaze. By the time I had dialed 911, the garage door was on fire. 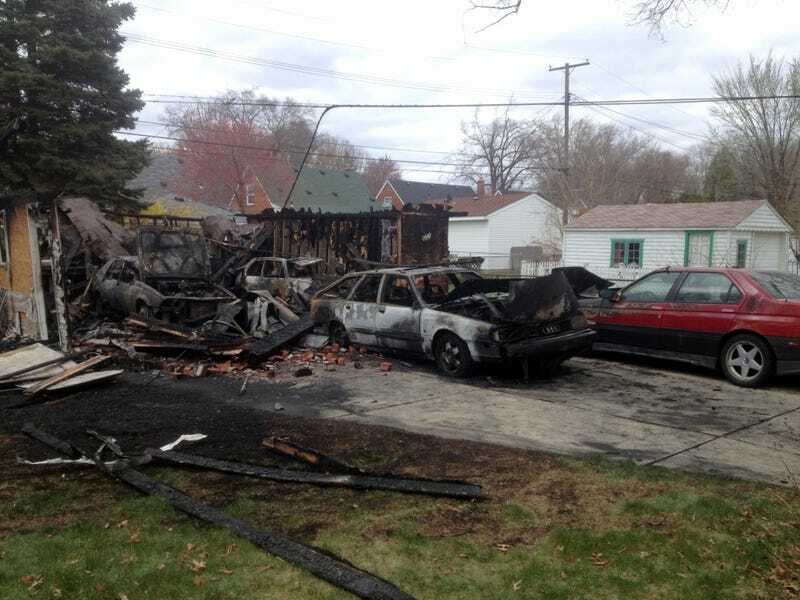 The garage burned down, taking my 84 GTI, and my brother’s Audi 200 TQ Avant and Alfa 164Q with it. There wasn’t much left to break on that Alfa. I really thought I had tamed it. The lost garage is manageable, and I can find more tools. I could even buy an actual sorted Milano and enjoy it. I could probably even bring a rough one back to health like I did with the last, and I think I will. I’m a bit put off by columns I’ve seen lately that lament locking button position, or naming schemes, or a lack of third row seats. Maybe it would be easier to be so easily entertained by cars. But, I just don’t operate that way. When I got in my Alfa to drive, I enjoyed every second of the pre-flight checklist – oil level, oil temp, coolant leaks, fuel leaks, rattles, vibrations, etc. I loved getting it onto jack stands to double check the recent work; to get the torque wrench out and make sure that everything was torqued to spec. I loved the trips under hood to loosen the 13mm on the base of the distributor to dial in some advance. I loved that first WOT run through the gears once the oil was warmed up, and the double clutch on the first to second shift to avoid irritating the 2nd gear synchro. I read reviews of the new 4C, and I see trite mentions of “flaws, character, and passion”. Well, any carbon composite car without a muffler is going possess those traits. That isn’t the Alfa speaking though. My Alfa was unique in any era, and a true performance car without compromise. More often than not, I’d spent 8 hours in the garage after a full day at the office, just to extricate any last flaw and to return the car to its original, uncompromised state. My Milano was a car that made me want to drive 10/10, made me want to see how far I could make it, and even more, made me want to start an argument. I’m well aware of the character and passion inherent to the brand, but please, stop it with the flaws. If they bother you, then you don’t get it. Alfa owners aren’t ok with flaws, and we gladly address them when they come up. We carry on the development work started by the factory in the name of perfection. I can’t believe how much I miss that fucker. And please, keep an appropriately-sized fire extinguisher at hand in the garage.